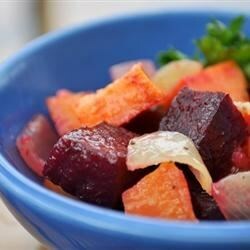 This is a great autumn or winter side dish. The colors are beautiful and make a nice autumn presentation. And only 37 calories per serving. Dovetailing tip: Prepare and cook and additional 3 bunches of beets. Peel and slice them so they are ready for the Meal 3 Beets and Blood Orange Salad. Mix the remaining 1 1/2 tablespoons olive oil, garlic powder, salt, and pepper in a large resealable plastic bag. Place the sweet potatoes and onion in the bag. Seal bag, and shake to coat vegetables with the oil mixture.